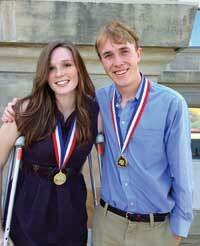 Four Blaine County students have earned Congres-sional Award gold medals this year. They are Max Durtschi, Alexandra Harten, Matthew Reidy and De-von Sherrerd. The students met the award requirements of 400 hours of voluntary public service, 200 hours of physical fitness and 200 hours of goal-oriented personal development through employment or developing a new skill or interest. Each planned and executed three wilder-ness, travel or adventure experiences. Durtschi attended the Community School and Wood River High School. He was a Sun Valley Ski Education Foundation Nordic skier and an elite cyclist before leaving for Colorado to train for national and interna-tional competitive cycling. He completed high school online while racing bikes nationally and internationally. Durtschi graduated as a National Merit Scholar, a National Honor Society member and a Johns Hopkins Center for Talented Youth scholar. He is studying neuroscience at Dart-mouth College in New Hampshire. Harten, 17, is a Community School senior and honors student who has served as student body president and is equally active in the community at large. Harten’s academic passions are government and de-bate. Last year, she co-founded the Community School’s new debate team. A lifelong competitive figure skater and lover of theatrical skating, Harten was the 2013 U.S. Figure Skating National Showcase Champion of Novice Light Entertainment. Reidy, 18, graduated with honors as salutatorian of Wood River High’s class of 2014 and is planning to at-tend Tufts University in Boston, Mass. He was Wood River’s outstanding four-year social studies and hu-manities recipient last year. A Lincoln-Douglas debater, Reidy was a member of Wood River’s team that won the Idaho High School Activities Association State Class B championship in March—Wood River’s first state debate title in 10 years. He seeks out opportunities to debate events and learn about government and leadership. Sherrerd, 18, graduated with honors from the Community School in June and will attend the University of Virginia. She earned several local scholarships and has been an active community volunteer. She competes in A-rated Hunter/Jumper shows and shares her lifelong love of horses by volunteering at Swiftsure Ranch Therapeutic Equestrian Center. Four other Blaine County students are currently working towards Congressional Award gold medals. Joyce Chan, Derek Thompson, Jolie Blair and Ty Reinemann have been presented with silver and bronze Congressional Award medals. Through the Landmark Congressional Award Act of 1979, the U.S. Congress authorized the Congressional Award Medal to recognize youth ages 14-23. Although Idaho ranks 39th in population size, the state ranks fifth in the number of Congressional Award recipients. Thirty-five Idaho students earned gold, silver and bronze medals in 2014. Nearly one-fourth were from the Wood River Valley.